In general, when people hear the word “robot” they immediately think of a piece of machinery that looks and acts like a human. In the world of plant operations, “robot” brings productivity and assembly to the mind of an operator. But even in this specific definition of the machinery, operators often refer to the types of robots in terms of their applications like handling robots, palletizing robots, packaging robots, etc. A simpler, more complete definition of robotic types can be narrowed down to five types: Cartesian, Cylindrical, SCARA, 6-Axis and Delta. Each industrial robot type has specific elements that make them best-suited for different applications. The main differentiators among them are their speed, size and workspace. Knowledge of each operating aspect of all five types can help machine designers choose the best robot for their process. 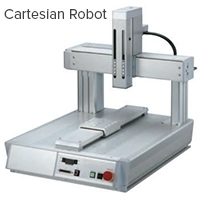 The most commonly used robot type for the majority of industrial applications is Cartesian. Plant operators often default to this type because they are easy to use and program. The linear movements of the Cartesian elements give the robot a cube-shaped workspace that fi ts best with pick-andplace applications and can range from 100 milimeters to tens of meters. These robots are also a popular choice because they are highly customizable. Customers can determine the stroke lengths, speed and precision of the robots because most of the parts arrive separately and are assembled by the machine builders. That being said, one drawback to Cartesian robots is the complexity of assembly required. Overall, plant operators choose this robot design most often for the flexibility in their confi guration that allows them to meet specific application needs. Cylindrical robots are very simple and similar to Cartesian in their axis of motion. Most Cylindrical robots are made of two moving elements: rotary and linear actuators. Because they have a cylindrical work envelope, machine designers might select them for their economy of space. The robot can be placed in the middle of a workspace and, because of its rotation element, it can work anywhere around it. Simple applications where materials are picked up, rotated and then placed work best for Cylindrical robots. Installation and use are not complex, and they come as fairly complete solutions with minimal assembly. 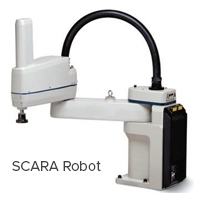 SCARA robots offer a more complete solution than the Cartesian or Cylindrical. They are all-in-one robots, meaning a SCARA robot is equipped with x, y, z and rotary motion in one package that comes ready-to-go, apart from the end-of-arm tooling. The work envelope is similar to Cylindrical robots but it has more degrees of motion in a radius or arch-shaped space. Applications are also similar to Cylindrical and Cartesian robots, but SCARA robots can move quicker than the other two. They are seen often in biomed applications due to their small work area. Because SCARAs have the easiest integration they seem like the best solution for the majority of applications, but Cartesians are more common because of their level of customization. 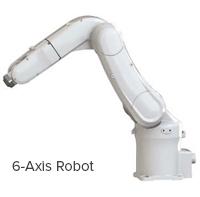 Another all-in-one robot type is the 6-Axis. Though sometimes 6-Axis robots can be almost toy-sized, they are typically very large and used for large assembly jobs such as putting seats into a car on an assembly line. These robots operate like a human arm and can pick up materials and move them from one plane to another. An example of this would be picking a part up from a table top and putting it into a cupboard — something the other robot types cannot do easily. 6-Axis robots can move quick and come in complete solutions like SCARAs, however, their programming is more complicated. The robots can get so large and move so quickly that, if roller coaster seats were attached to them, they could simulate an amusement park ride. Because they are one of the largest of the five robot types, most designers choose them for their ability to make movements that others cannot to compensate for the loss of space. As the fifth and fi nal type, Delta robots are the fastest and most expensive. They have a unique, dome-shaped work envelope in which they can achieve very high speeds. Delta robots are best for fast pick-and-place or product transfer applications like moving parts from a conveyor belt and placing them in boxes or onto another conveyor belt. They also come as complete solutions for machine designers but are more complicated in use than the 6-Axis or SCARA robots. 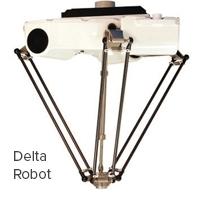 The main advantage of Delta robots is their speed and precision with which they operate. Across the board, all five types of robots come with almost the same level of safety implications. The typical method of protecting an operator from getting pinched or hit is an external system that basically creates a fence around the robots. This fence is a hard guard with a gate that, when opened by an operator, tells the robot to stop moving or switch to a mode of slow operation. This hard guard protects both the operator and the product by not allowing anyone to tamper with the robot when it is in use. As far as maintenance goes, there is no standard across the board for the robotic types. Maintenance periods mostly depend on the environments in which the robots are operating and their duty cycle. For example, processes with heavy exposure to dirt or dust will require more frequent maintenance on all robot types than processes in clean rooms. When designers are making the decision to implement one of the five robot types in their processes, they need to consider the basic starting points for any motion application: load, orientation, speed, travel, precision, environment and duty cycle. Determining these factors will draw direct correlations to the corresponding robot type that will give them the most efficient and effective results in their plant.